The Hub Review: Say hello to this Dolly! Say hello to this Dolly! Jacquelyn Piro Donovan leads the singing waiters in the title tune. Slowly, up in Beverly, a small theatrical renaissance has been going on at the North Shore Music Theatre. As loyal readers may recall, the nonprofit company which had built an audience there over several decades suddenly collapsed as the economy went bust in 2008, and for a time it looked as if the property might be sold, and the theatre even demolished. Luckily, however, no one actually listens to Ed Siegel, and the North Shore has seen leaps in its subscription audience every year. And as the company has grown more financially confident, its productions have grown plusher and more stylish (although I hear that backstage it's still an extremely lean ship). The management programs, I admit, a good deal of newer commercial work that appeals to the suburbs but has little interest for me - but I don't complain about that as long as it pays the bills for productions like Hello, Dolly! 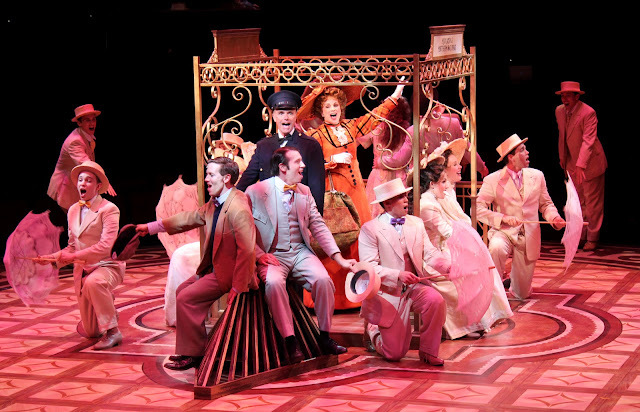 (above), a thoroughly charming version of this classic that's sweet, light on its feet, and showcases several of the best musical performers around. Gary Beach and Jacuelyn Piro Donovan. Although right up front - one caveat. If you're one of those who believe that this particular show is really only a frame for its star performer, then prepare to have your mind changed (if it can be changed, that is). For believe it or not, this is a convincing ensemble version of Dolly! - partly, it's true, because the talented Jacquelyn Piro Donovan (who stepped in for an indisposed Lorna Luft) is a perfectly likable leading lady, but lacks a truly distinctive stage personality. Donovan has the pipes for the part, is a good hoofer, and knows how to nail her laughs - she's fine, really; but she is never actually beguiling, I'm afraid - and the improbable charm of matchmaker Dolly Gallagher Levi is, I think, essentially the show's calling card. And yet somehow the production as a whole does beguile; Ms. Donovan, it turns out, is a team player, and she is surrounded by quite a team. I was particularly taken with Gary Beach, a Tony nominee who gives a courtly edge to the curmudgeonly Horace Vandergelder (a client of Dolly's who is actually her own matrimonial target). And there was warm, sincere work from Matt Loehr (late of the Broadway casts of The Producers and Mary Poppins) and Eric Mann, who together made comic hay out of Vandergelder's innocent clerks, who cross paths with him in cognito on their own romantic adventures in Manhattan. Plus there was lovely singing on tap from Analisa Leaming, who made the little-known "Ribbons Down My Back" practically a show-stopper. The chorus, meanwhile, both danced and sang well, under the guidance of director Charles Repole and choreographer Michael Lichtefeld, who together also helmed the exquisite My Fair Lady the North Shore fielded last summer (and thank God the theatre was smart enough to invite them back!). My advice is - remember those names, at least if you're a fan of classic Broadway. For Repole and Lichtefeld seem to know precisely how to do it; they have managed to somehow conjure the original, frothy essence of Dolly! without slavishly imitating its template (although don't worry, the familiar tentpoles of "The Waiters' Gallop" and the title number still hew closely to tradition). 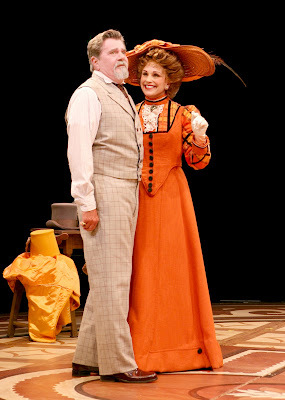 Elsewhere, I was surprised at how well these two had adapted this proscenium show to the North Shore's arena (Lichtefeld works a particular miracle with "Put on Your Sunday Clothes"). But what was most striking was how superbly they caught the tone of the show - "gay" in the old-fashioned sense of being brightly colored, and buoyant with Jerry Herman's sunny, contradictory mix of optimism and nostalgia. 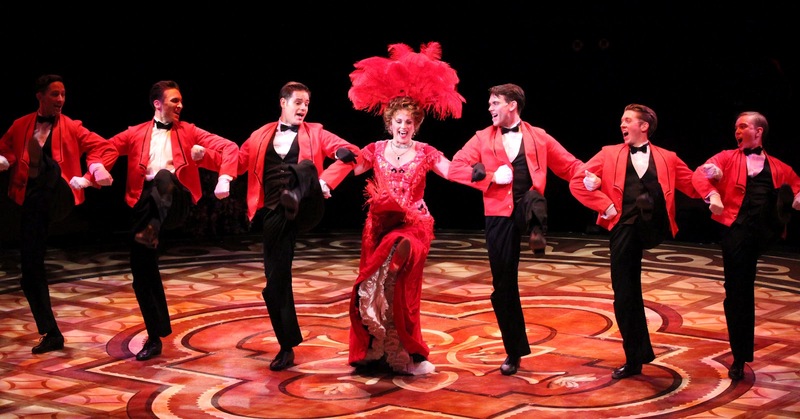 I suppose I have to admit this Hello, Dolly! may have never been galvanized by star power, but I was still quite sad to bid it good-bye. The company puts on their Sunday clothes.